Welcome to the Cray 150 Publications website! A Happy Easter to all. Cray 150 Publications aims to organise or support local arts and heritage events. Please have a look at our calendar and please come and join us for friendship and fun. Photo: Remembering Pirate Radio! - launched at Easter 1964 the various pirate radio stations in the North Sea were a big thrill for pop music fans. For example Radio Caroline broadcasting from the Mi Amigo and later the Ross Revenge (pictured). Thursday 25th April at St Mary's Church Centre, St Mary Cray (10.30am - 11.30am). Croft Poetry Club meeting. Theme: Famous Quotations. Sunday 5th May at St Mary's Church, St Mary Cray (3pm - 5pm). Music & Poetry for a Lazy Summer Afternoon. Another of the very enjoyable series of concerts featuring the Illyrica String Quartet and the Croft Poetry Club. Admission £7 including refreshments. Thursday 9th May at the Croft Tea Room, St Mary Cray (10am - 11am). Croft Poetry Club meeting. Theme: Inspirational words and poems. Monday 20th May at Shortlands Library (2.15pm - 3pm). Jerry Dowlen will give an illustrated talk on Stately Homes in Popular Fiction. Admission free (small donation for refreshments). Wednesday 22nd May at the Croft Tea Room (7pm - 8.30pm). Croft Book Club meeting. Theme: Railways. Thursday 23rd May at St Mary's Church Centre 10.30am - 11.30am). Croft Poetry Club meeting. Theme: Philip Larkin. Cray 150 Publications started the new year 2019 with a series of illustrated talks devised by Richard Bowdery and Jerry Dowlen featuring the lives and works of famous authors, playwrights and poets who are former residents of Bromley borough. Our photo shows Richard and Jerry at the opening talk given at Petts Wood branch library in February 2019. Our talk was repeated at Orpington library on 9th March and at Chislehurst library on 9th April. The authors covered in our talk were: H.G. Wells, Enid Blyton, Richmal Crompton, Walter de la Mare, David Nobbs, Lord Ted Willis, Hanif Kureishi, G.F. Newman (Judge John Deed) and Dave Roberts (The Bromley Boys). We made mention too of the splendid number of local small publishers of local history books and of art and poetry featuring the work of local residents. A light-hearted look at city, town and village signs that commemorate famous former residents of Bromley Borough and its near neighbourhoods in Kent and London. Read about David Bowie and many other famous ex-residents of Bromley since the days of Julius Caesar at Keston in 55BC. Lots of lovely colour photos and illustrations. Price £4.95 this book can be purchased at the Croft Tea Room. March 2017: Jerry Dowlen has written a second book about the City of London. His new book So Long, C.U. is a sequel to his earlier book The City of London: Wandering and Wondering (2013). Jerry's illustrated Talks about London are proving popular in our locality. Photo (left): Jerry and Laura at the Short Bites monthly lunchtime event at Orpington Library on 7th March when there was a full capacity attendance for the topic of Writers and Their Love of London. For details of Jerry's two books about the City of London please click on the tab above. The author Carole Wells is the now-retired original founder and owner of St Mary Cray's most popular tea room and community hub. In this beautifully illustrated book Carole describes the Tearoom's fascinating journey from derelict building to heart and soul of its community. Price £3.95. All sale proceeds go to the Tea Room. The game of chess is played on a board with 64 squares. In the 64 pages of this book you'll find lots of amusing, surprising and interesting information about the history of the game, its past and present most famous players, and its enduring popularity in clubs and schools. When was the only time that a world chess champion came to Bromley? When was a game of chess played for the first time in outer space? What is 'Alice' chess? - ''Blitz' chess? - and 'Blindfold' chess? Which famous British war hero pioneered the first chess-playing computer? You'll know the answers to these questions after you've read Jerry's very enjoyable book. Our little booklet takes a brief, nostalgic tour of Millstream, the former church magazine, during the period 1950 to 2015. There are reminders of the different front cover illustrations that have been produced during the years, including the superb drawings by John Blundell. And we have made a small selection of especially interesting and sometimes curious items that were printed inside the magazine by way of news stories or feature articles. This booklet can be obtained from St Mary's Church, St Mary Cray. A social history of St Mary Cray, Kent and its famous football club the Cray Wanderers. Published on 18 April 2015 price £9.95. Copies may be purchased at the Croft Tea Room, St Mary Cray or at Cray Wanderers FC home matches. Copies may be purchased from the Croft Tea Room or Bromley Libraries. [Sorry! Fully sold out - October 2015] A collection of original art and writing from St Mary Cray and Orpington, Kent. Published on 11 October 2014 . Forever Amber: Cray Wanderers FC 1860 - 2010. Published in 2011. [ Hurry! Only a few unsold copies remaining.] 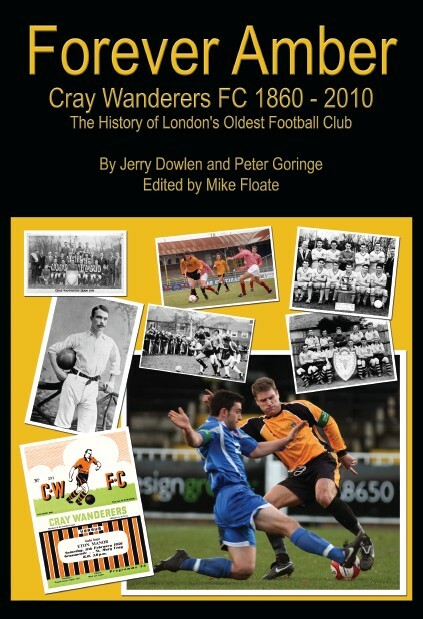 The 150-year old history of our famous local football club Cray Wanderers - the oldest football club in London. The narrative story is illustrated with a superb array of old archive photographs and memorabilia, with emphasis on key periods in the club's development, leading players and personalities, trophies, and the search for a permanent home ground within the Crays district that will end the club's long exile since 1973. Copies may be purchased at the Croft Tea Room, St Mary Cray, at Bromley Libraries or at Cray Wanderers FC home matches. Jerry Dowlen worked in the City of London from the days of the Swinging ‘Sixties till the New Millennium and the 2012 Olympics. In his book, 'Wandering and Wondering' Jerry celebrates his own personal favourites of the City’s historical, literary and architectural gems. After Football, Nothing Much Happens. Donald ‘Ted’ Ward was Orpington’s most famous poet of the modern era. He moved into the area after the Second World War. Ted published several volumes of poetry from 1971 until his death in February 2003 when he was aged 93. In this short tribute book to Ted, we celebrate his poetic associations with our local town of Orpington and the surrounding countryside. We also recall fond memories of Ted as a football fan and friend for many years on the terraces of Cray Wanderers FC. Ken Collishaw - Cray Wanderers FC Goalscoring Legend. This book recalls the playing career of Ken Collishaw who was an outstanding local footballer in the 1950s and 1960s. 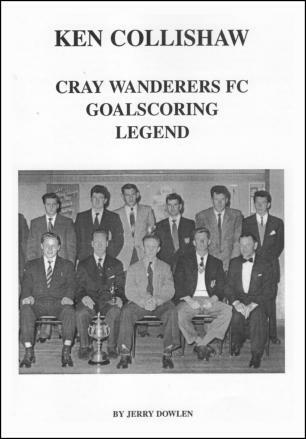 Ken played centre-forward for Cray Wanderers and scored 274 goals for the Club. He also played for Bromley and Tonbridge. 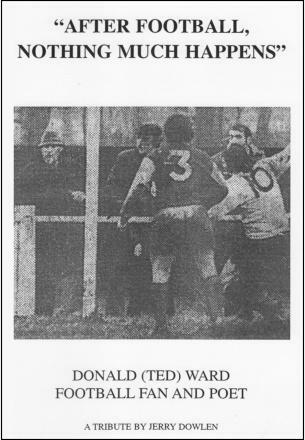 With the help of photographs and other archive material, and interviews with many Orpington and Cray locals who greatly admired Ken’s exciting football skills, this book offers a nostalgic journey into a bygone era of goals, goals, goals!